This set contains EDITABLE calendars for the 2018-2019 school year (August 2018-July 2019). 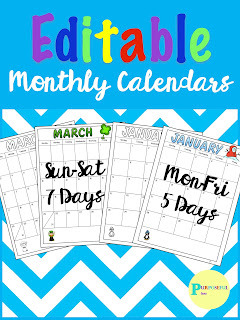 Each printable calendar has text boxes that you can input the information of your choice. The monthly calendars are in color and black & white. The twelve months of calendars have the option of Monday-Friday (5 days) or Sunday-Saturday (7 days) a week. The calendar can provide daily behavior documentation and opens communication with parents. You can have students color in the behavior earned for the day in the square at the end of the day.